Even without NFL logos, Trinity has carved out a spot with many collectors over the years and that continues with 2016 Leaf Trinity Football. The premium product focuses on appealing designs and hard-signed content. Every hobby box delivers five autographs. When you break it down, there is really not much to 2016 Leaf Trinity Football, but that is a good thing. The all-autograph release incorporates just three main designs. Keeping things simple, the Trinity Signature Cards work with a horizontal design that leaves ample room for the many Inscriptions that are found. 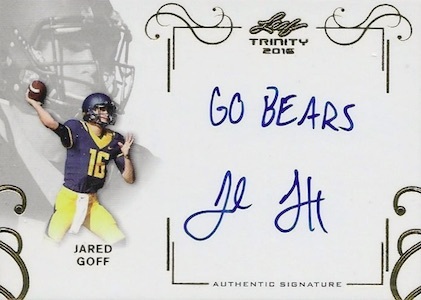 Making their debut are Trinity Clear Autographs that showcase on-card signatures on an acetate stock with a vertical layout. 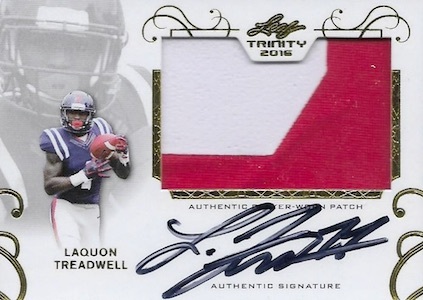 Lastly, Signature Patch Cards offer both on-card autographs and player-worn jersey swatches in one horizontal design. Building on the options, several 2016 Leaf Trinity Football parallels extend across each of the inserts with versions as low as one-of-one. 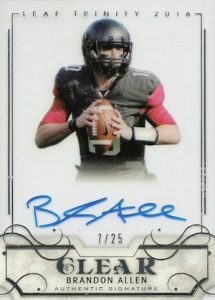 Increasing the overall rarity, Leaf revealed that production for 2016 Leaf Trinity Football was cut by 20%. PARALLEL CARDS: Silver #/25 (No #JG1), Gold #/10 (#JG1 - #/9), Red #/5, Purple 1/1, Printing Plates 1/1. *Card #CA-CC2 is a redemption. Card #CA-CH1 found only in parallels. Some subjects do not have Printing Plates. View specific options with the full spreadsheet. PARALLEL CARDS: Red #/25, Blue Spectrum #/10, Silver Spectrum #/5, Gold Spectrum 1/1, Printing Plates 1/1. *Card #PA-PL1 has printing plates only. Some subjects do not have printing plates. View specific options with the full spreadsheet. Some subjects do not have printing plates. View specific options with full the spreadsheet.